Peering through the iron safety bars of her room in Brooklyn—bars that made the room all the more feel like a prison—a wide-eyed 11-year-old girl looked out, gazing on the lights of the Empire State Building. With its majestic spire, reaching toward the heavens for more than eight decades, that building could have been in a different world, even though it was part of the same city. “It makes me feel like there’s something going on there,” whispered Dasani, whose name also had the cachet of a different world. She can see the magically transformed Manhattan across the Hudson River, but do the people there know about Dasani—can they see her? Thus begins the first of an astonishing five-part series in the New York Times, “Invisible Child,” beautifully penned by Andrea Elliott. It’s a story about a girl filled with hope while living with her family in the worst homeless shelter in New York City, one that by all accounts is devoid of hope, a building fraught with despair and danger. Dasani’s story could have come right from the pages of Robert Coles’s multivolume classic, Children of Crisis. Andrea Elliott, the author of the five-part New York Times piece, delves into the many causes behind the homelessness of Dasani and her family. (The original full text can be found here: http://nyti.ms/1crU5aU.) In the first article, we find Dasani’s parents, Chanel and Supreme, fighting drug addictions, habits of despair that certainly played a part in the their irresponsible actions and inability to lift the family out of the extreme poverty of homelessness. However, the reasons behind what Chanel and Supreme did and did not do are much more complex. Questions abound: How does one overcome deep-rooted problems in an atmosphere of hopelessness, poverty, joblessness, and crime? Some clues lie in the dedication of administrators and leaders at Dasani’s school, the Susan S. McKinney Secondary School of the Arts. The school was named after the first African American woman to become a physician in New York State. Like its namesake, the school is doing what it can to overcome the extraordinary challenges of doing great things amid a society that does not care about invisible children and is not willing to invest the money and other resources to ensure its success—rather, society (both in attitude and its economic system) is undermining it. McKinney is a sanctuary of hope, learning, and sanctity; yet, it is overshadowed, literally and figuratively by the prospect of a private charter school occupying the prized top floor of the school building, which would further squeeze the McKinney and the children it serves for space and funds. The writing of Jonathan Kozol comes to mind: McKinney is like St. Ann’s, the sanctuary for impoverished children in the Bronx featured in Ordinary Resurrections and other books. Further, in reference to the socioeconomic, ethnic, and racial division between McKinney and the proposed charter school, printed fliers warn of a social and economic “apartheid,” bringing to mind Kozol’s searing indictments in Savage Inequalities and Shame of a Nation. Then, there is a glimmer of hope. The first article mentions Dasani’s love and talent for dancing and gymnastics. “Dasani’s got something that has not been unleashed yet,” says the principal. This theme will underlie the remainder of the series, leading to a surprise ending. For a girl like Dasani, the girl of a family without a home, a school trip to Gracie Mansion was an experience of high metaphoric contrast, the manic an absurd situation of a beautiful home without a family. A graph shows the sharp increases of children living in shelters in New York City, now exceeding 22,000—more than twice as high as what it was at the turn of the century and the coming of the new millennium and an increase from the number in 1990 by a factor of five. To give this staggering number visual perspective, if every homeless child in New York City were invited to attend an event at Madison Square Garden, the huge arena would be beyond capacity, leaving more than 4,800 children without a seat. The omnipresent physical and emotional perils of New York City’s homeless shelters are described in detail, all the more reason Dasani’s school is her true home, yet one where “a future rests on a foundation that’s fragile.” It is here that Dasani’s teachers, principal, and Dasani herself try to overcome the sobering odds. The theme of extreme income inequality continues in “A Profound Divide in a Neighborhood Transformed,” the third article. Part 1. 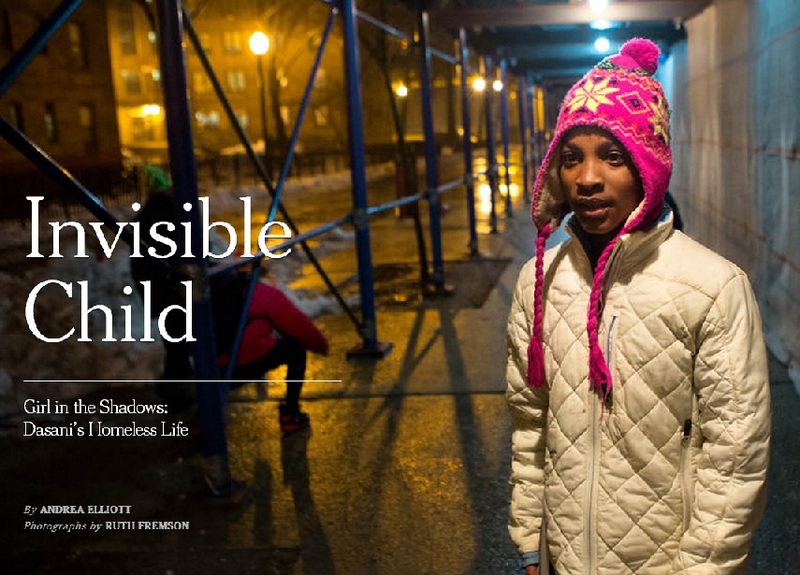 Girl in the Shadows: Dasani’s Homeless Life. New York City has been reborn. Yet, children like Dasani have been left behind, a statistic of the more than one in five children living in poverty. Among the industrialized nations, only Romania has a higher child poverty rate. Dasani’s family, home life, and school are interlaced. Dasani shows great joy and potential with her dancing; the rest of the series will cover this theme, and in the end, we learn where this will take Dasani. Part 2. A Future Resting on a Fragile Foundation. This essay explores how the Susan McKinney Secondary School of the Arts is part of the “bedrock of Dasani’s life.” The contrasts among Dasani’s cramped quarters and her family’s homeless shelter, McKinney, and Gracie Mansion (the billionaire Mayor’s house, where he does not even live) show the extreme differences and disparities between the very rich and the very poor—and hope and hopelessness. Part 3. A Profound Divide in a Neighborhood Transformed. Many parts of Brooklyn have made a comeback, with luxury homes for residents with family incomes of more than $100,000 side by side with pockets of extreme poverty, along with shops and other businesses that cater to each group, reflecting their profound difference. Part 4. Finding Safety and Strength in the Bonds of Her Siblings. The family as a source of support and the difficult choices everyone faces are chronicled; these choices are never easy and could well have profound effects on everyone’s future. Part 5. Amid Repressed Hopes, Reasons to Dream. Dasani’s family returns to Harlem, to the Harriet Tubman Center. Like its namesake, this public building could lead the family from the bonds of poverty to the freedom of self-sufficiency and the security and dignity that come with it. There, they attend a meeting of the Five Percent Nation, the movement Malcolm X founded when he broke from the Nation of Islam. They seek a fitness guru, Warren Hassan Bradley, a short man better known as Giant, who gave up his life of crime to found Bartendaz, an organization that sells DVDs of aerobic gymnastics and dance with an underlying strong message of self-improvement. Dasani’s family has found a place for their daughter to take advantage of her gifts—with the hope that Dasani will be able to break the vicious cycle of her family’s extreme poverty. This is a powerful and artistically masterly piece about the death penalty, not from a cold statistical point of view, rather from the perspective of being right where this tragic scene slowly, painfully unfolds. 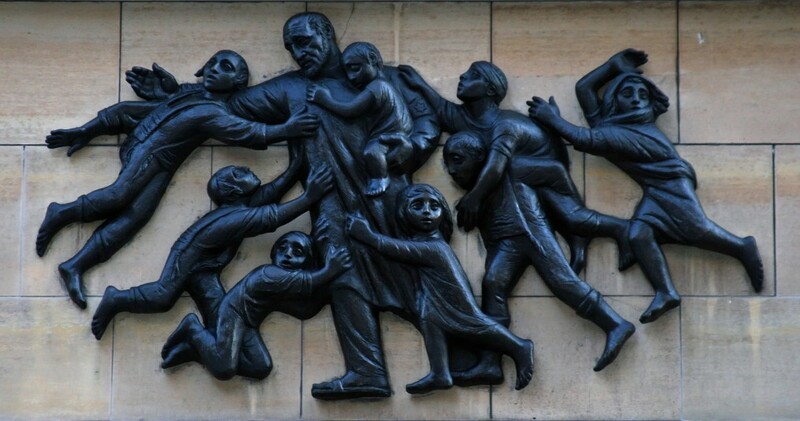 Janusz Korczak believed that life and death were to be faced with dignity. I am sure he would have been appalled with what happened in this Texas penitentiary. Our Feature Presentation: Kendall F. Person’s The Right to Life episode III Life & Death the finale.